3 Reasons why you're NOT getting Physique Results | Eat, Train, Thrive! On that struggle bus, right? A lot of women are, you’re not alone. Keep on reading because I want you to stop spinning your wheels. If you’re reading this, you have probably tried to lose weight by eating very little, or, as I like to call it, eating like a bird. For workouts, you have probably bought into the idea of endless circuit training with light weights, with high cardio activity in the form of either running or hitting the elliptical or ever-popular stair mill. Does that sound about right?! One more thing, on top of that, you probably discovered group fitness classes, or were already doing them and added the above things to your regimen. Don’t get me wrong, Group Fitness classes are great, and can have their place. I am a Group Fitness Instructor as well. Group Fitness is a great introductory period to fitness. It’s great for the community, and if you struggle with motivation, it can be motivating and encouraging to be there doing it with others until you get a hold on it. The problem, or problems, as I am about to reveal, is that it’s too much! This was working at first – well sort of, at least the scale was going down, AmIRight?! However, you were also holding on by a thread? Eventually, you caved in, threw the towel in, and gained all the weight back, plus some. You’re not prioritizing Strength Training, i.e., Lift The Things. If your goal is Body change, which means having less body fat and visible muscle tone, you need to lift. Body change is achieved through Strength Training and a modest caloric deficit. 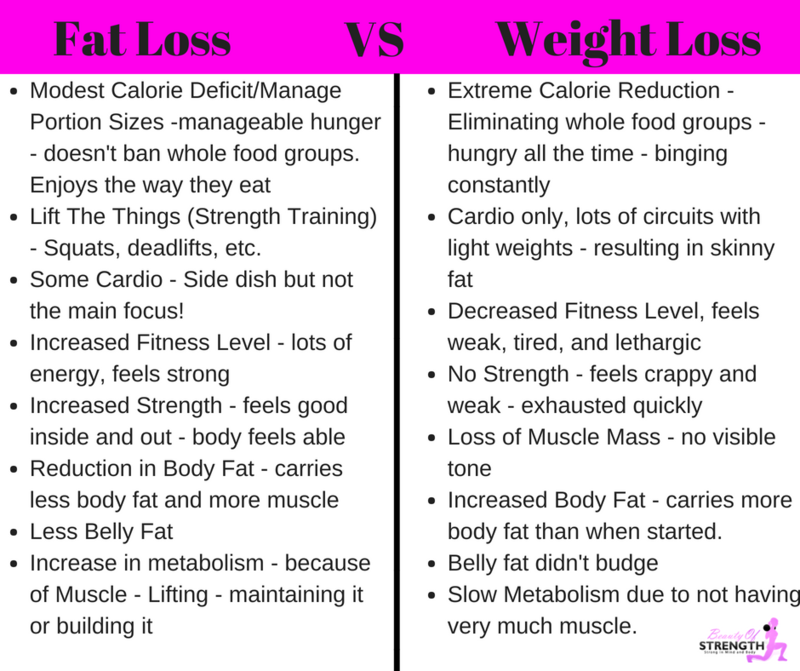 Body change, or body composition, is about fat loss, not weight loss. Remember that. Check out the graphic I put together below. If you’re doing a lot of cardio type activity and not doing any Strength Training you will lose weight. However, you will just be a smaller version of yourself with no muscle tone. Usually, you will even have more body fat than when you started. If that’s what you want, then go for it. I’m willing to guess that’s not what you want! Women tell me all the time that they want to “Tone” up, but they are not training in a way to achieve this. Ladies what you are doing is chasing the calorie burn, trying to shrink, trying to get smaller. And you’re doing just that, but losing muscle at the same time, and this no Bueno! You’ll most likely end up with the skinny-fat appearance. Another reason that you are not getting the physique results is that you were not eating enough. I know most women think that they have to eat around 1200 calories or less, and this couldn’t be further from the truth! I used to think more was better – go lower, or as low as I could with my calorie intake and do more exercise. Eating less backfired to eating a whole lot MORE and training more backfired too! I couldn’t sustain the extreme calorie deficit; therefore, when the weekends rolled around, bam wham, thank you, ma’am, I went hog wild. Sometimes I didn’t even make it to the weekend. So, I was in the perpetual yo-yo diet, as you are now – gaining and losing the same weight over and over. It’s miserable, am I right?! You have to eat enough food so that you can enjoy how you eat, sustain it, and still get results through a modest calorie deficit – that does not require you to suffer. Do me a favor and yourself a favor so that you can get the results that you are seeking and be able to sustain them. – Work on building New nutritional, fitness, and movement habits! – Eat adequate protein: A palm size of protein per meal or about .7-1g per pound of bodyweight! – Be Patient: Fat loss takes time! Trust the process. – Get good sleep: 7-8 hours a night. – Walk, and I mean more than one day a week! Aim for 7-10,000 steps a day! Remember, if you are looking for that toned look, be sure to Prioritize Strength Training and stop the endless cardio type activity. You will see that “Tone” that you wish to see! Need help with this? Don’t hesitate to reach out. 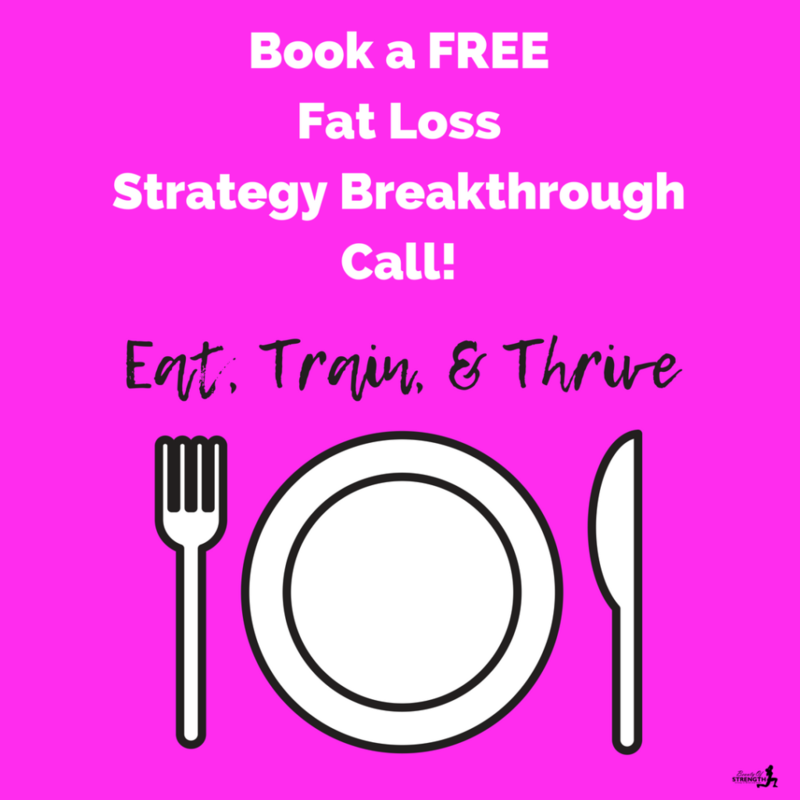 Book a FREE Fat loss Breakthrough Strategy Call here. I got you; I know this stuff is hard to navigate alone. Click here to Book your call! In the meantime, come on over to my Sisters in Strength Community! An Online Community for Women who are TIRED of the Extremes, tired of Losing and Gaining the Same Weight over and over, TIRED of the Quick Fixes, and the Voodoo Quackery. Sisters in Strength is a place for Women who LOVE the IRON – we LIFT The THINGS! We Eat, We Train, and We THRIVE!